Every one of us likes to win at any game that we play? Rummy experts can swim across the rough sea at all times. Wondering how they overcome every tough challenge that comes in their way. The answer lies in the fact that in addition to their mastery of Rummy rules, they also know every hacks, tricks, and strategy to win the game. Give them any tough scenario they will dance their way to victory. Here are the few points that you must consider if you are really willing to go all the way. In rummy card game online, there are two types of jokers – Printed Joker and Wildcard. While it’s true that they help the gameplay but one has to be careful not to completely rely on joker as a Perfect sequence is always mandatory. In other cases, you can joker cards as much as you want. Rummy is a game that requires your utmost patience and resilience. You cannot become an overnight sensation by winning a few games. Players can reach that mastery only when they have sufficient practice. For it, staying with utmost focus is very important. A highly desirable method followed by every rummy expert is to reduce the number of high-value cards. These cards carry high points (10, J, Q, K, A) so in the event, you lose the game with these cards in hands then you will lose by a heavy margin. But if they form a perfect sequence or a set, then there’s no need of a worry. Bait is one of the popular concepts used in classic rummy. At times while playing rummy online, you may need only one card to complete a sequence/run in such cases a For example, if you are having cards like J♣, Q♣ and A♣ and you just need K♣ to complete the run, you may throw in A ♣ or J ♣ as a bait to your opponent. Upon checking the discarded card, your opponent may think that you are not making any sequences with ♣ high cards and may just discard the K♣ which will help you to complete a pure sequence with 3 cards. This is a modern-day strategy that many players are using. When the starting hands of yours are absolutely terrible leaving you no choice to move forward, it’s better to fold your hand right away to avoid losing by more points. You can refer to the article on Classic Rummy online starting hands, you may get it. 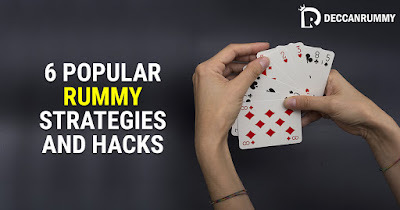 Now that you know something about rummy hacks, what you need to do is deploy them one at a time or probably even more and go for the victory. Keep playing rummy game online at Deccan Rummy for exceptional offers and promotions.